The Naturalest Naturalist: Rock out with your hawks out! Broad-winged Hawk (Buteo platypterus) alert! In that last few decades, the mystery of Broad-winged Hawk migration has been slowly unraveling on southern Vancouver Island. Every fall, the species is now recorded in small numbers (usually <10 individuals) primarily from hawk watch efforts at Rocky Point Bird Observatory and Beechey Head. I had an unfortunately brief but exciting encounter with a juvenile Broad-winged Hawk at Mount Tolmie on Friday (September 21, 2012) afternoon. 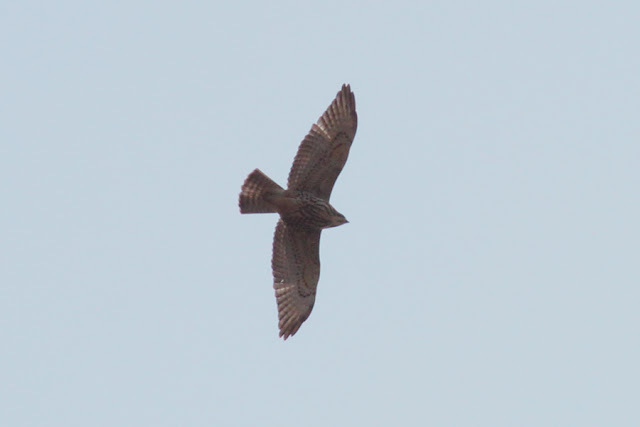 I had never seen a juvenile Broad-winged Hawk on southern Vancouver Island and I'm not sure if that's because I primarily hone in on the more obvious pattern of adults or if they're genuinely less frequent here. I always enjoy actually identifying something rather than complacently accepting it as the obvious choice by range. 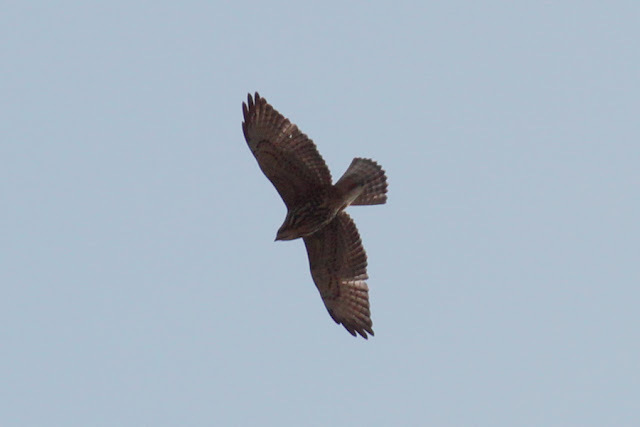 As a result, I decided to go through the identification of this bird as a juvenile Broad-winged Hawk and not a Red-shouldered Hawk (B. lineatus). Before a well-documented record of an adult Red-shouldered Hawk over Rocky Point in 2009, the species was considered hypothetical based on a handful of sightings with insufficient details. Obviously I had a vested interest in trying to make it a Red-shouldered, but seeing a juvenile Broad-winged would be quite exciting as well. I managed a couple photos which I mildly adjusted due to compensate for the extremely backlit conditions. When I first saw the bird, it had its wings swept back and was moving rapidly past me. It was much smaller (approximately two-thirds the size) than the Red-tailed Hawk (B. jamaicensis) just ahead of it, so my immediate reaction was Broad-winged Hawk. I thought I was never going to be able to say for sure because I lost sight of it in seconds, but I jogged up to upper viewpoint of Mount Tolmie on the off chance that it would find a thermal to rise up on and start circling again. And that's what happened. With a better look at the bird, I still suspected it was a Broad-winged Hawk but felt like I was in slightly over my head because it was a juvenile. I noted the pointed wings which seemed reminiscent of my previous encounters with adults, and that proved to be a helpful feature. Here are a couple cropped shots of the bird in question. I know the lighting is still bad, but I didn't want to make it too unnatural and possibly distort the actual appearance. This bird lacks dark patagial marks (the "shoulder" area) on the leading edge of the wings and a band of streaks on the belly that form a distinct band. Instead, you see the chest and belly is uniformly streaked, the underwing coverts are flecked with dark spots with no strong patagial mark, and the throat has a central dark stripe, which matches a juvenile Broad-winged Hawk. This shot shows the pointed wings off nicely, which is apparently good for Broad-winged Hawks and should distinguish it from the more squared look of a Red-shouldered Hawk's wings. Additionally, a pale crescent near the wing tips would likely be visible in this backlit shot if it was a Red-shouldered Hawk. Aside from the wing shape and pale wing crescents, I was having trouble finding obvious differences between Broad-wingeds and Red-shouldered Hawks. I then realized most of the references I was looking over referred to the lineatus subspecies from the east and I should have been comparing to the western subspecies elegans. The bird documented in 2009 belonged to the latter and it is expected more will show up with their slow-but-continual northward expansion. Western juveniles have stronger barring on their flight feathers and are heavily marked with rufous-brown on the underwing coverts not unlike an adult, as indicated by a helpful information sheet from Princeton Press found here. As a result, if my bird was a Red-shouldered Hawk it would show some rusty tones on the underside of the wings. The individual I saw definitely did not possess any rusty tones under the wings. There has been one record of an eastern Red-shouldered in California, however, so it was good that I noted the pointed wings and lack of crescent-shaped panels near the wing tips just to eliminate this unlikely scenario, as well. This exercise has been very enlightening for me and I think I will be that much more ready if a Red-shouldered Hawk decides to cross my path. Hopefully you gained something from this breakdown analysis as well. If you want to see more photos to compare some juvenile hawks, check this juvenile hawks in flight entry on the Stokes Birding Blog. Now get out and enjoy the hawk migration while you can! To answer your question about the ratio of adult to juvenile Broad-winged Hawks on Vancouver Island, I believe I have seen about 3 juveniles from Rocky Point or East Sooke Park over the years, vs. about 25 adults. Thanks, Guy. I wonder why there is such a disparity between the number of adults moving through compared to juveniles? Ian Cruickshank expressed a similar ratio from his experience down here. I wonder if they just take a more interior route? I guess a congratulations is also in order as I see you had your first Broad-winged Hawk up in Nanoose. It's always great to find a bird you have been anticipating in your stomping grounds! Nicely documented, too! The Nanoose Rare Birds Committee will have no problem with it... they have one, right? I used to wonder if we weren't just mis-identifying them as Red-tails. After having done about 10 years of hawk-watches in the Peace, where we do record a more even ratio of adults to juveniles. That just doesn't make sense. Truthfully, I really don't know why we record so many more adults than we do juveniles.